If you want a comprehensive text about the psychological and technical aspects of fine drawing, look no further than Harold Speed’s The Practice & Science of Drawing (1917). This is one of the recommended texts for first year atelier students. Mind blown. I wanted to write a post of my notes and impressions for each of the books on the syllabus as I finished them, but the information is so rich I will need to make one post per concept. This first is a fun one. Vision. How we see, what we see, why, and what happens to our brains when we draw. Already in the atelier we’ve spoken quite a bit about how children draw symbolically, as did early civilizations. There are many reasons that this is a hard wired intuition for the human brain. Much of the difficult work in the first year of the atelier is rewiring the way you see, learning to quiet your brain and listen to your eyes. Imagine a circle atop a line. A little further down, two new lines extend out perpendicularly and then two more lines radiate from the end. We already have something solid here. For decoration there are a few shorter lines about the top of the circle, then two dots, a triangle and a curved line inside the circle. There. Done. A portrait of you by a child. Oh, it’s you alright. It has all your essentials. Similar shapes make up the bulls on the cave walls at Lascaux and with more decoration the murals of ancient Egypt. To explain why we draw from feeling rather than from sight, Speed notes that our survival relies on “learning early to associate ‘the feel of an object’ with its appearance.” Before they learn to focus their eyes, infants feel objects with their hands and mouths and so they learn to associate objects with feeling – texture, weight, temperature, solidity – before they learn to focus on the contours. Then when called on to draw a picture, children consult their senses about the object, and the strongest is touch. This is advantageous to a young child who is learning to identify the difference between safe and dangerous objects. The knife is sharp, the stove is hot, the cat is soft on the back but not on the teeth and so on. 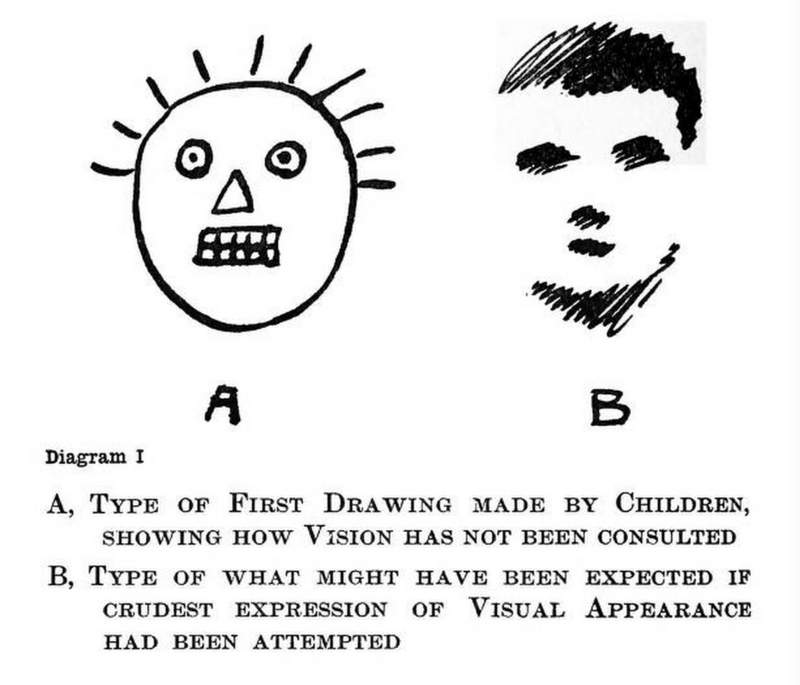 The observation of the picture on the retina for what it is as form and colour has been neglected — neglected to such an extent that when the child comes to attempt drawing, sight is not the sense he consults. The mental idea of the objective world that has grown up in his mind is now associated more directly with touch than with sight, with the felt shape rather than the visual appearance. So that if he is asked to draw a head he thinks of it first as an object having a continuous boundary in space. This his mind instinctively conceives a line. There are two aspects from which the objective world can be apprehended. There is the purely mental perception founded chiefly on knowledge derived from our sense of touch, associated with vision, whose primitive instinct is to put an outline round objects as representing their boundaries in space. And secondly there is the visual perception, which is concerned with the visual aspects of objects as they appear on the retina. If the student neglects line drawing , his work will lack the expressive significance of form that only a feeling for lines seems to have the secret of conveying; while, if he neglects mass drawing, he will be poorly equipped when he comes to express form with a brush full of paint to work with. Earlier this week, I was struggling in the life room with a drawing that was working out okay and then completely fell apart somewhere between the right hip and knee. The model was seated on a stool with the right foot propped on a middle rung of the stool. The thigh was foreshortened. I tried all sorts of angles and placements – is it further away from the body or directly below? A teaching assistant came around and said “ah, the way that thigh is foreshortened, it’s actually twice as wide as it is long.” What the what? How is that possible? But sure enough. He said, don’t look at it as a thigh, look at it as a little ham. That made it easier. The brain could accept that a ham might have that shape, but a thigh? I’ll have to work on seeing that for myself.